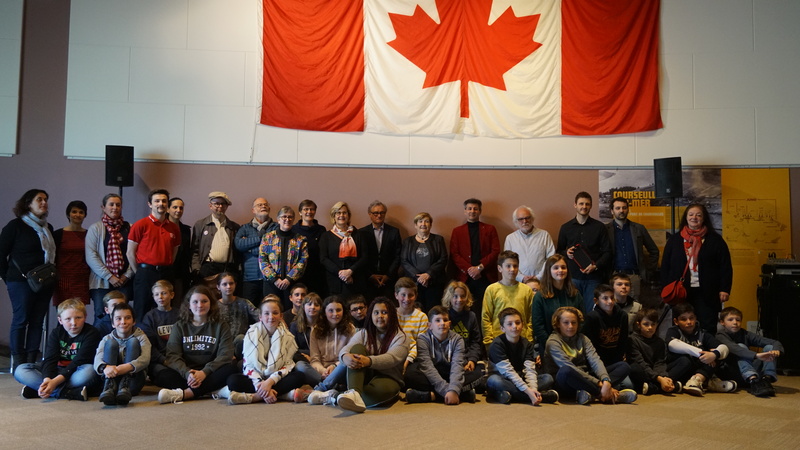 On Monday, April 1st, 2019, the Juno Beach Centre inaugurated the new youth circuit Explore Juno in the presence of Mrs. Marie-Agnès POUSSIER-WINSBACK, Vice President of the Normandy Region in charge of Tourism. We also had the honour of the presence of Mr Jacques BELIN, President of the pôle TES; Mrs. Lydia LEMANCHEC, principal of the college of Courseulles; Mr Franck JOUY, President of Coeur de Nacre; Chantal ROCHE, Deputy Mayor of Courseulles-sur-Mer; Anaïs LEBOT and Isabelle LEBRETON, Tourism Department at the Normandy Region; Dominique SAUSSEY, Officer of the D-Day Club Normandy Tourism; Denis GEHANNE, President of Terres de Nacre; Delphine LANDEMAINE, CCI of Caen; Anne SCHNEIDER and a dozen students in Mediation Master at ESPE Caen. A big thank you to Vincent COTE, guide at the Juno Beach Centre and to the 6th TRITON of QUINTEFEUILLE college in Courseulles-sur-Mer, who participated in Explore Juno as a class for our inauguration with their teachers Mrs. Helene FORGET and Mrs. LIARD. This inauguration was an opportunity for Nathalie Worthington, Director of the Juno Beach Centre, to thank the designers of the Explore Juno circuit: Michel COUSIN, scenographer; Vincent FRANCOISE, Yuri PERCHEY and Jérémy COUILLET, Twelve Solutions for the development of the digital app; Frédérick TURGIS and Annabel SAULNIER, Graphic Design LA BELLE OUVRAGE; Marie-Eve VAILLANCOURT and Marie-Fei DE GUIRE, both of whom have worked in Canada on course design and mediation. Nathalie Worthington also thanked the Normandy Region, represented by Marie-Agnès POUSSIER-WINSBACK for the region’s support of a 40 000 € investment out of a 140 000€ global investment. Nathalie Worthington also reminds us that this was an 18-month project.